Motto: "Trenton Makes, The World Takes"
Trenton is the capital city of the State of New Jersey and the county seat of Mercer County. The city is officially considered to be within the Greater New York City Combined Statistical Area. As of the 2010 United States Census, Trenton had a population of 84,913, making it the state's 10th-largest municipality. The Census Bureau estimated that the city's population was 84,349 in 2013. Trenton dates back at least to June 3, 1719, when mention was made of a constable being appointed for Trenton, while the area was still part of Hunterdon County. Boundaries were recorded for Trenton Township as of March 2, 1720, a courthouse and jail were constructed in Trenton around 1720 and the Freeholders of Hunterdon County met annually in Trenton. Trenton became New Jersey's capital as of November 25, 1790, and the City of Trenton was formed within Trenton Township on November 13, 1792. Trenton Township was incorporated as one of New Jersey's initial group of 104 townships by an Act of the New Jersey Legislature on February 21, 1798. Portions of the township were taken on February 22, 1834, to form Ewing Township. On April 10, 1837, Trenton Township was dissolved and became part of Trenton city. A series of annexations took place over a 50-year period, with the city absorbing South Trenton borough (April 14, 1851), portions of Nottingham Township (April 14, 1856), both the Borough of Chambersburg Township and Millham Township (both on March 30, 1888), as well as Wilbur Borough (February 28, 1898). The first settlement which would become Trenton was established by Quakers in 1679, in the region then called the Falls of the Delaware, led by Mahlon Stacy from Handsworth, Sheffield, England. Quakers were being persecuted in England at this time and North America provided the perfect opportunity to exercise their religious freedom. During the American Revolutionary War, the city was the site of the Battle of Trenton, George Washington's first military victory. On December 26, 1776, Washington and his army, after crossing the icy Delaware River to Trenton, defeated the Hessian troops garrisoned there. After the war, Trenton was briefly the national capital of the United States in November and December 1784. The city was considered as a permanent capital for the new country, but the southern states favored a location south of the Mason-Dixon Line. During the War of 1812, the primary hospital facility for the U.S. Army was at a temporary location on Broad Street. Trenton is located at 40°13′26″N 74°45′50″W﻿ / ﻿40.223748, -74.764001 (40.223748,-74.764001). According to the United States Census Bureau, the city had a total area of 8.155 square miles (21.122 km2), of which, 7.648 square miles (19.809 km2) of it was land and 0.507 square mile (1.313 km2) of it (6.21%) of it was water. Several bridges across the Delaware River — the Trenton-Morrisville Toll Bridge, Lower Trenton Bridge and Calhoun Street Bridge – connect Trenton to Morrisville, Pennsylvania, all of which are operated by the Delaware River Joint Toll Bridge Commission. Trenton is located in almost the exact geographic center of the state (the official geographic center is 5 miles (8.0 km) southeast of Trenton). Due to this, it is sometimes included as part of North Jersey and as the southernmost city of the Tri-State Region. Others consider it a part of South Jersey and thus, the northernmost city of the Delaware Valley. Trenton has long been part of the Philadelphia television market. However, following the 2000 United States Census, Trenton was shifted from the Philadelphia metropolitan statistical area to the New York metropolitan statistical area. With a similar shift by the New Haven, Connecticut, area to the New York area, they were the first two cases where metropolitan statistical areas differed from their defined Nielsen television markets. However, Mercer County constitutes its own metropolitan statistical area, formally known as the Trenton-Ewing MSA. Locals consider Trenton to be a part of ambiguous Central Jersey, and thus part of neither region. They are generally split as to whether they are within New York or Philadelphia's sphere of influence. While it is geographically closer to Philadelphia, many people who have recently moved to the area commute to New York City, and have moved there to escape the New York region's high housing costs. Trenton is one of two state capitals that border another state – the other being Carson City, Nevada. According to the Köppen climate classification, Trenton lies in the transition from a humid subtropical (Cfa) to a humid continental climate (Dfa), with four seasons of approximately equal length and precipitation fairly evenly distributed through the year. Winters are cold and damp: the daily average temperature in January is 31.1 °F (−0.5 °C), and temperatures at or below 10 °F (−12 °C) occur on 3.9 nights annually, while there are 16−17 days where the temperature fails to rise above freezing. Summers are hot and humid, with a July daily average of 75.7 °F (24.3 °C); temperatures reaching or exceeding 90 °F (32 °C) occur on 15−16 days. Extremes in temperature have ranged from −14 °F (−26 °C) on February 9, 1934, up to 106 °F (41 °C) as recently as July 22, 2011. However, temperatures reaching 0 °F (−18 °C) or 100 °F (38 °C) are uncommon. Snowfall can vary even more year-to-year. The average snowfall is 23.4 inches (59.4 cm), but has ranged from as low as 2 in (5.1 cm) in the winter of 1918–19 to as high as 76.9 in (195.3 cm) in 1995–96, which included the greatest single-storm snowfall, the Blizzard of January 7–8, 1996, when 24.2 inches (61.5 cm) of snow fell. As of the 2010 United States Census, there were 84,913 people, 28,578 households, and 17,747 families residing in the city. The population density was 11,101.9 inhabitants per square mile (4,286.5 /km2). There were 33,035 housing units at an average density of 4,319.2 per square mile (1,667.7 /km2). The racial makeup of the city was 26.56% (22,549) White, 52.01% (44,160) African American, 0.70% (598) Native American, 1.19% (1,013) Asian, 0.13% (110) Pacific Islander, 15.31% (13,003) from other races, and 4.10% (3,480) from two or more races. Hispanic or Latino of any race were 33.71% (28,621) of the population. There were 28,578 households out of which 32.0% had children under the age of 18 living with them, 25.1% were married couples living together, 28.1% had a female householder with no husband present, and 37.9% were non-families. 30.8% of all households were made up of individuals and 9.1% had someone living alone who was 65 years of age or older. The average household size was 2.79 and the average family size was 3.40. In the city the population was spread out with 25.1% under the age of 18, 11.0% from 18 to 24, 32.5% from 25 to 44, 22.6% from 45 to 64, and 8.8% who were 65 years of age or older. The median age was 32.6 years. For every 100 females there were 106.5 males. For every 100 females age 18 and over, there were 107.2 males. The Census Bureau's 2006-2010 American Community Survey showed that (in 2010 inflation-adjusted dollars) median household income was $36,601 (with a margin of error of +/- $1,485) and the median family income was $41,491 (+/- $2,778). Males had a median income of $29,884 (+/- $1,715) versus $31,319 (+/- $2,398) for females. The per capita income for the city was $17,400 (+/- $571). About 22.4% of families and 24.5% of the population were below the poverty line, including 36.3% of those under age 18 and 17.5% of those age 65 or over. As of the 2000 United States Census there were 85,403, people, 29,437 households, and 18,692 families residing in the city. The population density was 11,153.6 people per square mile (4,304.7/km²). There were 33,843 housing units at an average density of 4,419.9 per square mile (1,705.9/km²). The racial makeup of the city was 52.06% Black, 32.55% White, down from 88.6% in 1950, 0.35% Native American, 0.84% Asian, 0.23% Pacific Islander, 10.76% from other races, and 3.20% from two or more races. Hispanic or Latino of any race were 21.53% of the population. The Lower Trenton Bridge is commonly referred to among locals as the "Trenton Makes Bridge". The city of Trenton is home to numerous neighborhoods and sub-neighborhoods. The main neighborhoods are taken from the four cardinal directions (North, South, East, and West). Trenton was once home to large Italian, Hungarian, and Jewish communities, but since the 1950s demographic shifts have changed the city into a relatively segregated urban enclave of middle and lower income African Americans. Italians are scattered throughout the city, but a distinct Italian community is centered in the Chambersburg neighborhood, in South Trenton. This community has been in decline since the 1970s, largely due to economic and social shifts to the more prosperous, less crime-ridden suburbs surrounding the city. Today Chambersburg has a large Latino community. Many of the Latino immigrants are from Mexico, Guatemala and Nicaragua. There is also a significant and growing Asian community in the Chambersburg neighborhood primarily made up of Burmese and Bhutanese/Nepali refugees. The North Ward, once a mecca for the city's middle class, is now one of the most economically distressed, torn apart by race riots following the assassination of Martin Luther King in 1968. Nonetheless, the area still retains many important architectural and historic sites. North Trenton still has a large Polish-American neighborhood that borders Lawrence Township, many of whom attend St Hedwig's Roman Catholic Church on Brunswick Ave. St. Hedwig's church was built in 1904 by Polish immigrants, many of whose families still attend the church. North Trenton is also home to the historic Shiloh Baptist Church—one of the largest houses of worship in Trenton and the oldest African American church in the city, founded in 1888. The church is currently pastored by Rev. Darrell L. Armstrong, who carried the Olympic torch in 2002 for the Winter Olympics in Salt Lake City. Also located just at the southern tip of North Trenton is the city's Battle Monument, also known as "Five Points". It is a 150 ft (46 m) structure that marks the spot where George Washington's Continental Army launched the Battle of Trenton during the American Revolutionary War. It faces downtown Trenton and is a symbol of the city's historic past. East Ward is the smallest neighborhood in Trenton and is home to the Trenton Train Station as well as Trenton Central High School. Recently, two campuses have been added, Trenton Central High School West and Trenton Central High School North, respectively, in those areas of the city. The Chambersburg neighborhood is within the East Ward, and was once noted in the region as a destination for its many Italian restaurants and pizzerias. With changing demographics, many of these businesses have either closed or relocated to suburban locations. The City of Trenton is governed within the Faulkner Act, formally known as the Optional Municipal Charter Law, under the Faulkner Act (Mayor-Council) system of municipal government by a Mayor and a seven-member city council. Three city council members are elected at-large, and four come from each of four wards. The mayor and council members are elected concurrently to four-year terms of office as part of the May municipal election. As of 2014, the Mayor of Trenton is Eric Jackson. Members of the City Council are Phyllis Holly-Ward (At-Large), Alex Bethea (At-Large), Duncan Harrison, Jr. (At-Large), Zachary Chester (West Ward), Marge Caldwell-Wilson (North Ward), George Muschal (South Ward), and Verlina Reynolds-Jackson (East Ward), all serving terms of office ending June 30, 2018. From February 7 to July 1, 2014 the acting mayor was George Muschal who retroactively assumed the office on that date due to the felony conviction of Tony F. Mack, who had taken office on July 1, 2010. Muschal, who was council president, was selected by the city council to serve as the interim mayor to finish the term. On February 7, 2014, Mack and his brother, Raphiel Mack, were convicted by a federal jury of bribery, fraud and extortion, based on the details of their participation in a scheme to take money in exchange for helping get approvals to develop a downtown parking garage as part of a fictitious sting operation by law enforcement. Days after the conviction, the office of the New Jersey Attorney General filed motions to have Mack removed from office, as state law requires the removal of elected officials after convictions for corruption. Initially, Mack fought the removal of him from the office but on February 26, a superior court judge ordered his removal and any actions taken by Mack between February 7 and the 26th could have be reversed by Muschal. Previously, Mack's housing director quit after it was learned he had a theft conviction. His chief of staff was arrested trying to buy heroin. His half-brother, whose authority he elevated at the city water plant, was arrested on charges of stealing. His law director resigned after arguing with Mack over complying with open-records laws and potential violations of laws prohibiting city contracts to big campaign donors. and the 12th Congressional District, a change made by the New Jersey Redistricting Commission that took effect in January 2013, based on the results of the November 2012 general elections. Template:NJ Legislative 15 The Governor of New Jersey is Chris Christie (R, Mendham). The Lieutenant Governor of New Jersey is Kim Guadagno (R, Monmouth Beach). In the 2008 presidential election, Democrat Barack Obama received 89.9% of the vote here (23,577 cast), ahead of Republican John McCain with 8.2% (2,157 votes) and other candidates with 0.5% (141 votes), among the 26,229 ballots cast by the city's 41,005 registered voters, for a turnout of 64.0%. In the 2004 presidential election, Democrat John Kerry received 79.8% of the vote here (18,539 ballots cast), outpolling Republican George W. Bush with 16.3% (3,791 votes) and other candidates with 0.4% (146 votes), among the 23,228 ballots cast by the city's 39,139 registered voters, for a turnout percentage of 59.3. In the 2009 gubernatorial election, Democrat Jon Corzine received 81.6% of the vote here (10,235 ballots cast), ahead of Republican Chris Christie with 12.4% (1,560 votes), Independent Chris Daggett with 2.4% (305 votes) and other candidates with 1.1% (135 votes), among the 12,537 ballots cast by the city's 38,345 registered voters, yielding a 32.7% turnout. The city of Trenton is protected on a full-time basis by the city of Trenton Fire and Emergency Services Department (TFD), which has been a paid department since 1892 after having been originally established in 1747 as a volunteer fire department. The TFD operates out of seven fire stations and operates a fire apparatus fleet of 7 engines, 3 ladders, and one rescue, along with two HAZMAT units, a mobile command unit, one fireboat, and numerous other special, support and reserve units. Trenton is the home of two post-secondary institutions. Thomas Edison State College serves adult students around the nation and worldwide. Mercer County Community College's James Kearney Campus. The Trenton Public Schools serve students in kindergarten through twelfth grade. The district is one of 31 former Abbott districts statewide, which are now referred to as "SDA Districts" based on the requirement for the state to cover all costs for school building and renovation projects in these districts under the supervision of the New Jersey Schools Development Authority. The Superintendent runs the district and the school board is appointed by the Mayor. The school district has undergone a 'construction' renaissance throughout the district. Trenton Central High School is Trenton's only traditional public high school. Schools in the district (with 2010-11 enrollment data from the National Center for Education Statistics) are Columbus Elementary School (PK-8; 228), Franklin Elementary School (K-5; 343), Grant Elementary School (PK-8; 506), Gregory Elementary School (PK-8; 371), P.J. Hill Elementary School (PK-8; 506), Dr. Martin Luther King Elementary School (was Jefferson; 461), Monument Elementary School (PK-8; 365), Mott Elementary School] (PK-8; 375), Parker Elementary School] (P-5; 402), Robbins Elementary School] (K-5; 395), Robeson Elementary School] Stokes Elementary School] (K-5; 165), Washington Elementary School] (PK-5; 300), Wilson Elementary School] (PK-5; 349), Calwalader 6-8 Alternative Program (was PK-5; 185 students), Dunn Middle School (6-8; 445),	Hedgepeth/Williams Middle School (was PK-8; 716), Kilmer Middle School (was PK-8; 452), Rivera Middle School, Daylight Twilight High School (9-12; 369), Trenton Central High School (9-12; 1,741) and Trenton Central High School West (9-12; 621). St. Raphael Grammar School, which serves students in Pre-K through 8th grade, operates under the auspices of the Roman Catholic Diocese of Trenton. Trenton Community Music School is a not-for-profit community school of the arts. The school was founded by executive director Marcia Wood in 1997. The school currently operates at Blessed Sacrament Catholic Church (on Tuesdays) and the Copeland Center for the Performing Arts (on Saturdays). In 2005, there were 31 homicides in Trenton, which at that time was the largest number in a single year in the city's history. The city was named the 4th "Most Dangerous" in 2005 out of 129 cities with a population of 75,000 to 99,999 ranked nationwide. In the 2006 survey, Trenton was ranked as the 14th most dangerous "city" overall out of 371 cities included nationwide in the 13th annual Morgan Quitno survey, and was again named as the fourth most dangerous "city" of 126 cities in the 75,000–99,999 population range. Homicides went down in 2006 to 20, but back up to 25 in 2007. In September 2011, the city fired 108 police officers due to budget cuts; this constituted almost one-third of the Trenton Police Department and required 30 senior officers to be sent out on patrols in lieu of supervisory duties. In 2013, the city set a new record with 37 homicides. The following is inscribed over the original entrance to the prison. As of 2010, the city had a total of 168.80 miles (271.66 km) of roadways, of which 145.57 miles (234.27 km) were maintained by the municipality, 11.33 miles (18.23 km) by Mercer County and 10.92 miles (17.57 km) by the New Jersey Department of Transportation and 0.98 miles (1.58 km) by the New Jersey Turnpike Authority. City highways include the Trenton Freeway, which is part of U.S. Route 1, and the John Fitch Parkway, which is part of Route 29. Canal Boulevard, more commonly known as Route 129, connects US Route 1 and NJ Route 29 in South Trenton. U.S. Route 206, Route 31, and Route 33 also pass through the city via regular city streets (Broad Street/Brunswick Avenue/Princeton Avenue, Pennington Avenue, and Greenwood Avenue, respectively). Routes 29 and 129 connect the city to Interstate 195 which provides connections with Interstate 295 and the New Jersey Turnpike (also known as Interstate 95). The Trenton Train Station, located on the heavily traveled Northeast Corridor, serves as the northbound terminus for SEPTA's Trenton Line (local train service to Philadelphia) and southbound terminus for New Jersey Transit's Northeast Corridor Line (local train service to Penn Station New York). The train station also serves as the northbound terminus for the River Line; a diesel light rail line that runs to Camden. Two additional River Line stops, Cass Street and Hamilton Avenue, are located within the city. The closest commercial airport is Trenton-Mercer Airport in Ewing Township, about 8 miles (13 km) from the center of Trenton, which is served by Frontier Airlines nonstop to and from 10 points nationwide. Other nearby major airports are Newark Liberty International Airport and Philadelphia International Airport, located 55.2 miles (88.8 km) and 43.4 miles (69.8 km) away, respectively and reachable by direct New Jersey Transit or Amtrak rail link (to Newark) and by SEPTA Regional Rail (to Philadelphia). New Jersey Transit provides bus service between Trenton and Philadelphia on the 409 route, with service to surrounding communities on the 600, 601, 602, 603, 604, 606, 607, 608, 609 and 611 routes. As mentioned above, Trenton is part of the Philadelphia television market. While it is its own radio market, Philadelphia and New York stations are both easily receivable. Because of Trenton's relative distance to New York City and Philadelphia, and because most homes in Mercer County receive network broadcasts from both cities, locals are sharply divided in fan loyalty between both cities. It is not uncommon to find Philadelphia's Phillies, Eagles, 76ers, Union and Flyers fans cheering (and arguing) right alongside fans of New York's Yankees, Mets, Nets, Knicks, Rangers, Jets, Red Bulls and Giants or the New Jersey Devils. Between 1948 and 1979 Trenton Speedway hosted world class auto racing. It was actually located in adjacent Hamilton Township. Drivers such as Jim Clark, A. J. Foyt, Mario Andretti, Al Unser, Bobby Unser, Richard Petty and Bobby Allison raced on the one mile (1.6 km) asphalt oval and then re-configured 1½ mile race track. The speedway, which closed in 1980, was part of the larger New Jersey State Fairgrounds complex, which also closed in 1983. The former site of the speedway and fairgrounds is now the Grounds for Sculpture. Cadwalader Park - city park designed by landscape architect Frederick Law Olmsted, who is most famous for designing New York City's Central Park. Old Barracks - Dating back to 1758 and the French and Indian War, the Barracks were used by both the Continental Army and British forces during the Revolutionary War and stands as the last remaining colonial barracks in the state. Trenton Battle Monument - Located in the heart of the Five Points neighborhood, the monument was built to commemorate the Continental Army's victory in the December 26, 1776, Battle of Trenton. The monument was designed by John H. Duncan and features a statue of George Washington atop a pedestal that stands on a granite column 148 feet (45 m) in height. Trenton City Hall - The building was constructed based on a 1907 design by architect Spencer Roberts and opened to the public in 1910. The council chambers stand two stories high and features a mural by Everett Shinn that highlights Trenton's industrial history. Trenton City Museum - Housed in the Italianate style 1848 Ellarslie Mansion since 1978, the museum features artworks and other materials related to the city's history. Trenton War Memorial - Completed in 1932 as a memorial to the war dead from Mercer County during World War I and owned and operated by the State of New Jersey, the building is home to a theater with 1,800 seats that reopened in 1999 after an extensive, five-year-long renovation project. William Trent House - Constructed in 1719 by William Trent, who the following year laid out what would become the city of Trenton, the house was owned by Governor Lewis Morris, who used the house as his official residence in the 1740s. Governor Philemon Dickerson used the home as his official residence in the 1830s, as did Rodman M. Price in the 1850s. Henry W. Antheil, Jr. (1912–1940), diplomatic code clerk, honored for service to United States. in the U.S. House of Representatives (1855–1857). William Lewis Dayton, Jr. (1839-1897), United States Ambassador to the Netherlands. in the U.S. House of Representatives (1949–55). Patrick Kerney (born 1976), professional American football player. New Atlantic, alternative rock band. Carl Anthony Payne II (born 1969), actor who played Theo Huxtable's best friend Cockroach on The Cosby Show and the dimwitted Cole Brown on Martin. in the U.S. House of Representatives (1933–1945). Norman Schwarzkopf, Jr. (1934-2012), Commander-in-Chief of the U.S. Central Command in the Gulf War. ^ a b 2005 New Jersey Legislative District Data Book, Rutgers University Edward J. Bloustein School of Planning and Public Policy, April 2005, p. 73. ^ Administrator, City of Trenton. Accessed July 12, 2012. ^ Office of the City Clerk, City of Trenton. Accessed July 12, 2012. 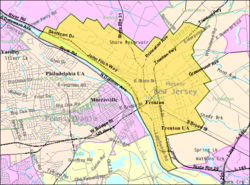 ^ USGS GNIS: City of Trenton , Geographic Names Information System. Accessed March 14, 2013. ^ a b c d e f DP-1 - Profile of General Population and Housing Characteristics: 2010 for Trenton city, Mercer County, New Jersey, United States Census Bureau. Accessed January 10, 2012. ^ a b c Table DP-1. Profile of General Demographic Characteristics: 2010 for Trenton city, New Jersey Department of Labor and Workforce Development. Accessed January 10, 2012. ^ a b c PEPANNRES - Annual Estimates of the Resident Population: April 1, 2010 to July 1, 2013 - 2013 Population Estimates for New Jersey municipalities, United States Census Bureau. Accessed June 16, 2014. ^ Zip Codes, State of New Jersey. Accessed September 7, 2013. ^ Area Code Lookup - NPA NXX for Trenton, NJ, Area-Codes.com. Accessed September 7, 2013. ^ Mercer County, NJ, National Association of Counties. Accessed January 20, 2013. ^ a b c The Story of New Jersey's Civil Boundaries: 1606–1968, John P. Snyder, Bureau of Geology and Topography; Trenton, New Jersey; 1969. pp. 164-165. Accessed August 21, 2012. ^ County History, Hunterdon County, New Jersey. Accessed April 18, 2011. ^ Krystal, Becky. "Trenton, N.J.: One for the history buffs", The Washington Post, February 10, 2011. Accessed January 10, 2012. "Back in the early 18th century, at least, the area was remote enough for Trent, a wealthy Philadelphia merchant, to build his summer home there near the banks of the Delaware River. And though it's dwarfed by its modern-day neighbors, at the time the home reflected its owner's 'ostentatious nature,' Nedoresow said. Further stroking his ego, he named the settlement he laid out 'Trent-towne,' which eventually evolved into the current moniker." ^ This Day in History - Dec 26, 1776: Washington wins first major U.S. victory at Trenton, History (U.S. TV channel). Accessed January 10, 2012. ^ Parker, L.A. "City celebrating role as U.S. capital in 1784", The Trentonian, November 6, 2009. Accessed January 10, 2012. "City and state leaders kicked off a two-month celebration yesterday with a news conference highlighting Trenton’s brief role as the capital of the United States in 1784." ^ A Short History of New Jersey, New Jersey. Accessed January 10, 2012. ^ Our Bridges, Delaware River Joint Toll Bridge Commission. Accessed July 15, 2013. ^ Science In Your Backyard: New Jersey, United States Geological Survey. Accessed October 28, 2014. ^ "New Statistical Area Information based on Census 2000", New Jersey Department of Labor and Workforce Development, December 14, 2004. Accessed January 10, 2012. ^ METROPOLITAN STATISTICAL AREAS AND COMPONENTS, December 2003, WITH CODES, United States Census Bureau. Accessed December 7, 2011. ^ Howe, Randy. Nifty 50 States Brainiac, p. 1159. Kaplan Publishing, 2008. ISBN 9781427797117. Accessed February 12, 2014. "Carson City is one of just two capital cities in the United States that borders another state; the other is Trenton, New Jersey." ^ Staff. "Heat sets new record high in Trenton at 106 degrees", The Trentonian, July 22, 2011. Accessed February 12, 2014. "The thermometer reached a record-setting 106 degrees here in the City of Trenton, easily smashing July 22nd's previous high mark from 1926, when the temp reached 101 degrees." ^ "City of Trenton, New Jersey Natural Hazard Mitigation Plan", City of Trenton. Accessed February 12, 2014. ^ "Station Name: NJ TRENTON MERCER CO AP". National Oceanic and Atmospheric Administration. ftp://ftp.ncdc.noaa.gov/pub/data/normals/1981-2010/products/station/USW00014792.normals.txt. Retrieved 2013-02-28. ^ Bowen, Francis. American Almanac and Repository of Useful Knowledge for the Year 1843, p. 231, David H. Williams, 1842. Accessed July 15, 2013. Population of 4,021 is listed for 1840, 14 less than shown in table. ^ Raum, John O. The History of New Jersey: From Its Earliest Settlement to the Present Time, Volume 1, pp. 276-7. J. E. Potter and company, 1877. Accessed July 15, 2013. "Trenton the capitol of the State, as well as the seat of justice of the county of Mercer, is beautifully located on the east bank of the Delaware, at the head of tide navigation. Here is located the State Capitol, built in 1793, enlarged in 1845 and 1865, and again in 1871. The State Prison, State Arsenal, State Normal and Model schools are also located here. The city has 7 wards. Its population in 1850, was 6,461; in 1860, 17,228; and in 1870, 22,874"
^ Debow, James Dunwoody Brownson. The Seventh Census of the United States: 1850, p. 139. R. Armstrong, 1853. Accessed July 15, 2013. ^ Porter, Robert Percival. Preliminary Results as Contained in the Eleventh Census Bulletins: Volume III - 51 to 75, p. 98. United States Census Bureau, 1890. Accessed November 20, 2012. ^ Fifteenth Census of the United States : 1930 - Population Volume I, United States Census Bureau, p. 712. Accessed January 10, 2012. ^ New Jersey Resident Population by Municipality: 1930 - 1990 at the Wayback Machine (archived May 2, 2009)., Workforce New Jersey Public Information Network, backed up by the Internet Archive as of May 2, 2009. Accessed January 10, 2012. ^ a b c d e f Census 2000 Profiles of Demographic / Social / Economic / Housing Characteristics for Trenton city, United States Census Bureau. Accessed January 10, 2012. ^ a b c d e f DP-1: Profile of General Demographic Characteristics: 2000 - Census 2000 Summary File 1 (SF 1) 100-Percent Data for Trenton city, New Jersey, United States Census Bureau. Accessed July 12, 2012. ^ The Counties and Most Populous Cities and Townships in 2010 in New Jersey: 2000 and 2010, United States Census Bureau. Accessed January 10, 2012. ^ DP03: Selected Economic Characteristics from the 2006-2010 American Community Survey 5-Year Estimates for Trenton city, Mercer County, New Jersey, United States Census Bureau. Accessed January 10, 2012. ^ "New Jersey - Race and Hispanic Origin for Selected Cities and Other Places: Earliest Census to 1990". U.S. Census Bureau. http://www.census.gov/population/www/documentation/twps0076/twps0076.html. ^ Bruder, Jessica. "JERSEYANA; Trenton's Fighting Words", The New York Times, May 2, 2004. Accessed March 16, 2012. "Trenton Makes, the World Takes, reads the famous red neon sign that spans a bridge between the state Capitol and Morrisville, Pa., affectionately known by locals as the Trenton Makes bridge.... In its heyday, Trenton was a world-class producer of rubber, steel, wire rope, and pottery. The cables for three famous suspension bridges - the Brooklyn, George Washington and Golden Gate - were produced here at John A. Roebling's factory." ^ Blackwell, Jon. "1911: 'Trenton Makes' history", The Trentonian. Accessed October 28, 2014. ^ Mickle, Paul. "1984: A whole new skyline", The Trentonian. Accessed October 28, 2014. ^ Raboteau, Albert. "Diversifying city's economy a major goal for Trenton", The Times (Trenton), January 30, 2003. Accessed October 28, 2014. "Another large goal is to lure private companies whose employees, officials say, are likely to work later in the evening and have more money to spend than the 20,000 or so state workers who swell downtown during business hours, then commute home to other municipalities." ^ Geographic & Urban Redevelopment Tax Credit Programs: Urban Enterprise Zone Employee Tax Credit, State of New Jersey, backed up by the Internet Archive as of May 25, 2009. Accessed August 2, 2011. ^ Di Ionno, Mark. "Chambersburg", The Star-Ledger, July 17, 2007. Accessed March 16, 2012. "The difference between Chambersburg, the traditional Italian section of Trenton, and other city neighborhoods that have undergone 'natural progression' is that Chambersburg hung on so long." ^ City Council, City of Trenton. Accessed March 16, 2012. ^ Elected Officials, p. 14. Mercer County, New Jersey, Revised January 26, 2012. Accessed February 12, 2014. ^ Meet the City Council, City of Trenton. Accessed February 12, 2014. ^ "Acting Mayor George Muschal assumes office and vows to put Trenton 'on the right track'". The Times (Trenton). February 26, 2014. http://www.nj.com/mercer/index.ssf/2014/02/acting_mayor_george_muschal_assumes_office_and_vows_to_put_trenton_on_the_right_track.html. Retrieved March 22, 2014. ^ Office of the Mayor: Biography, City of Trenton. Accessed August 11, 2013. ^ a b Pizzi, Jenna (March 4, 2014). "Trenton council to vote to install George Muschal as interim mayor". The Times (Trenton). http://www.nj.com/mercer/index.ssf/2014/03/trenton_council_to_vote_to_install_george_muschal_as_interim_mayor.html. Retrieved March 22, 2014. ^ via Associated Press. "Mayor Tony Mack of Trenton Is Found Guilty of Taking Bribes", The New York Times, February 7, 2014. Accessed February 12, 2014. ^ "NJ calls for convicted Trenton mayor Tony Mack to be removed", WPVI-TV, February 10, 2014. Accessed February 12, 2014. "The state Attorney General's Office filed a request Monday with a state Superior Court judge, asking that Tony Mack be kicked out of office, stripped of his pension and be barred from holding elected office again.... Under state law, people convicted of corruption cannot continue to hold public office. But since Mack has not resigned, the state is asking a judge to enforce the law." ^ via Associated Press. "A year of turmoil, stumbles for Trenton's mayor", The Star-Ledger, July 9, 2011. Accessed January 10, 2012. ^ 2012 New Jersey Citizen's Guide to Government, p. 65, New Jersey League of Women Voters. Accessed January 6, 2013. ^ 2011 New Jersey Citizen's Guide to Government, p. 65, New Jersey League of Women Voters. Accessed January 6, 2013. ^ Fire Department, City of Trenton. Accessed July 12, 2012. ^ Fire Houses and Location, City of Trenton. Accessed July 12, 2012. ^ Fast Facts, Thomas Edison State College. Accessed August 11, 2013. ^ The James Kerney Campus, Mercer County Community College. Accessed August 11, 2013. ^ Historic Rider, Rider University. Accessed February 12, 2014. "Gradually growing in size and scope through the first half of the 20th century, Rider began its move to a more spacious, suburban campus in 1959, when the first offices and classes moved to a 280-acre tract of land on Route 206 in Lawrence Township, N.J."
^ Abbott Districts, New Jersey Department of Education, backed up by the Internet Archiveas of May 15, 2009. Accessed August 20, 2012. ^ What are SDA Districts?, New Jersey Schools Development Authority. Accessed August 20, 2012. "SDA Districts are 31 special-needs school districts throughout New Jersey. They were formerly known as Abbott Districts, based on the Abbott v. Burke case in which the New Jersey Supreme Court ruled that the State must provide 100 percent funding for all school renovation and construction projects in special-needs school districts.... The districts were renamed after the elimination of the Abbott designation through passage of the state’s new School Funding Formula in January 2008." ^ SDA Districts, New Jersey Schools Development Authority. Accessed August 20, 2012. ^ Data for the Trenton Public Schools, National Center for Education Statistics. Accessed November 20, 2012. ^ Columbus Elementary School, Trenton Public Schools. Accessed August 11, 2013. ^ Franklin Elementary School, Trenton Public Schools. Accessed August 11, 2013. ^ Grant Elementary School, Trenton Public Schools. Accessed August 11, 2013. ^ Gregory Elementary School, Trenton Public Schools. Accessed August 11, 2013. ^ P.J. Hill Elementary School, Trenton Public Schools. Accessed August 11, 2013. ^ Dr. Martin Luther King Elementary School, Trenton Public Schools. Accessed August 11, 2013. ^ Monument Elementary School, Trenton Public Schools. Accessed August 11, 2013. ^ Mott Elementary School, Trenton Public Schools. Accessed August 11, 2013. ^ Parker Elementary School, Trenton Public Schools. Accessed August 11, 2013. ^ Robbins Elementary School, Trenton Public Schools. Accessed August 11, 2013. ^ Robeson Elementary School, Trenton Public Schools. Accessed August 11, 2013. ^ Stokes Elementary School, Trenton Public Schools. Accessed August 11, 2013. ^ Washington Elementary School, Trenton Public Schools. Accessed August 11, 2013. ^ Wilson Elementary School, Trenton Public Schools. Accessed August 11, 2013. ^ Calwalader 6-8 Alternative Program, Trenton Public Schools. Accessed August 11, 2013. ^ Dunn Middle School, Trenton Public Schools. Accessed August 11, 2013. ^ Hedgepeth/Williams Middle School, Trenton Public Schools. Accessed August 11, 2013. ^ Kilmer Middle School, Trenton Public Schools. Accessed August 11, 2013. ^ Rivera Middle School, Trenton Public Schools. Accessed August 11, 2013. ^ Daylight Twilight High School, Trenton Public Schools. Accessed August 11, 2013. ^ Trenton Central High School, Trenton Public Schools. Accessed August 11, 2013. ^ Trenton Central High School West Campus, Trenton Public Schools. Accessed August 11, 2013. ^ Elementary Schools. Trenton Public Schools. Accessed August 11, 2013. ^ Middle Schools. Trenton Public Schools. Accessed August 11, 2013. ^ High Schools. Trenton Public Schools. Accessed August 11, 2013. ^ New Jersey School Directory for the Trenton Public Schools, New Jersey Department of Education. Accessed August 11, 2013. ^ Approved Charter Schools, New Jersey Department of Education. Accessed February 12, 2014. ^ School Directory, Roman Catholic Diocese of Trenton. Accessed March 16, 2012. ^ About Us, Islamic School of Trenton. Accessed February 12, 2014. ^ 12th Annual Safest/Most Dangerous Cities Survey: Top and Bottom 25 Cities Overall. Accessed June 23, 2006. ^ Zdan, Alex. "Trenton police layoff plan to go into effect today", The Times (Trenton), September 16, 2011. Accessed January 10, 2012. "The 108 police officers slated to be terminated represent one-third of the force. Demotions affecting nearly 30 members will send current lieutenants and sergeants back to the street, depleting supervisor levels and the detective bureaus in an effort to keep patrols close to their current strength." ^ Queally, James. "N.J. homicides soared to seven-year high in 2013 after surges in Newark, Trenton", The Star-Ledger, January 1, 2014. Accessed February 12, 2014. "In Trenton, the number of homicides soared to 37, the most in the state capital’s recorded history." ^ Cumbler, John T. A Social History of Economic Decline: Business, Politics and Work in Trenton, p. 283. Rutgers University Press, 1989. ISN 9780813513744. Accessed February 12, 2014. ^ A Short History of Trenton State Prison, InsideOut: Fifty Years Behind the Walls of New Jersey's Trenton State Prison. Accessed March 16, 2012. ^ "InsideOut: Fifty Years Behind the Walls of New Jersey's Trenton State Prison". Windsorpress.net. http://www.windsorpress.net/io_hotp.html. Retrieved 2010-07-29. ^ Trenton Station Renovation, New Jersey Transit. Accessed March 16, 2012. ^ Mercer County Bus / Rail Connections at the Wayback Machine (archived May 22, 2009)., New Jersey Transit, backed up by the Internet Archive as of May 22, 2009. Accessed November 20, 2012. ^ Home page, WZBN. Accessed December 7, 2011. ^ History of State Fairgrounds, Grounds for Sculpture. Accessed March 16, 2012. As horses were replaced by automobiles for transportation, cars became the main attraction on the fairground's racetrack. 'Lucky' Teter and his Hell Drivers made the headlines in the 1930s; in the sixties it was midget car races and a 200-mile race for Indianapolis cars and drivers." ^ Patrick McGeehan (December 17, 2000). "Private Sector–A Wall St. Son at Nasdaq's Table". The New York Times. http://www.nytimes.com/2000/12/17/business/private-sector-a-wall-st-son-at-nasdaq-s-table.html. Retrieved July 15, 2010. ^ "Ball Parks of the Minor Leagues – Samuel J. Plumeri Field at Mercer County Waterfront Park – Trenton Thunder". Littleballparks.com. http://www.littleballparks.com/Stadium/2002/Trenton/trenton.htm. Retrieved July 15, 2010. ^ Josh Pahigian (2007). The Ultimate Minor League Baseball Road Trip: A Fan's Guide to AAA, AA, A, and Independent League Stadiums. Globe Pequot Press. ISBN 1-59921-024-X. http://books.google.com/books?id=1DaQ8oNXuE0C&pg=PA45&dq=plumeri+trenton. Retrieved July 15, 2010. ^ The History, Old Barracks Museum. Accessed September 7, 2013. ^ Trenton Battle Monument, New Jersey Department of Environmental Protection Division of Parks and Forestry. Accessed September 7, 2013. ^ Designing the Monument, New Jersey Department of Environmental Protection Division of Parks and Forestry. Accessed September 7, 2013. ^ Trenton City Hall, Library of Congress. Accessed September 7, 2013. ^ Welcome to the Trenton City Museum, Trenton City Museum. Accessed September 7, 2013. 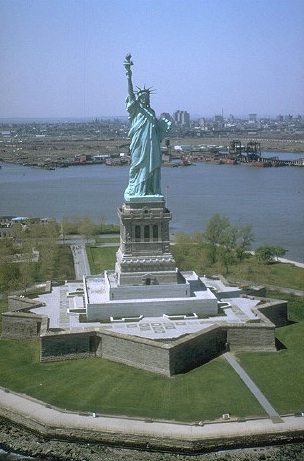 ^ Frequently Asked Questions about the War Memorial, New Jersey Department of State. Accessed September 7, 2013. ^ About the 1719 Trent House, William Trent House. Accessed September 7, 2013. "William Trent built his country estate north of Philadelphia, in New Jersey, at the Falls of the Delaware River about 1719.... In 1720 Trent laid out a settlement, which he incorporated and named 'Trenton.'" ^ Charles Conrad Abbott Papers, 1770–1919 (bulk 1874–1916): Finding Aid, Princeton University Library. Accessed January 25, 2011. ^ McAuliff, Michael. "Alito Bit of GOP Love", Daily News (New York), January 10, 2006. Accessed January 25, 2011. "With two rows of his family sitting behind him, Alito recounted his Trenton upbringing, the lives of his immigrant parents, and the culture clash he felt when he went to Princeton University in the late '60s." ^ Livingston, Guy. "George Antheil's Childhood in Trenton", Neue Zeitschrift für Musik, September 2001. Accessed January 25, 2011. ^ Staff. "AMERICANS REACH SAFETY IN SWEDEN; 43 Persons, Evacuated From Finnish Capital, Are Taken to Stockholm by Ship U.S. LEGATION IS MOVED Staff, Still on Duty, Takes Up Temporary Quarters About 12 Miles From Helsinki", The New York Times, December 6, 1939. Accessed January 25, 2011. ^ Phillips, Rashad. "MellowHype: Chordaroy Life", HipHopDX, July 15, 2011. Accessed March 30, 2012. "DX: Now as far as the L.A. scene, I read that you are actually from out East. Hodgy Beats: Yeah, I was born in East Lawrence, New Jersey and raised in Trenton until I was eight." ^ Thompson, Thomas. "Brash Bo Comes On with a Big Pitch", Life (magazine), June 8, 1962. Accessed January 25, 2011. ^ Atkins, Holly. "Welcome to Tangerine, and be careful", St. Petersburg Times, February 18, 2002. Accessed January 25, 2011. ^ Chass, Murray. "Twins Defeat Yanks for Sweep", The New York Times, May 7, 1971. Accessed January 25, 2011. ^ Staff. "Tal Brody returns to basketball home, A Trenton High star who became a star in Israel leads students on a U.S. exhibition tour. ", The Philadelphia Inquirer, October 13, 2006. Accessed January 25, 2011. ^ Staff. "BETTY BRONSON, 17, GETS PETER PAN ROLE; Sir James Barrie Selects Almost Unknown Film Actress After 100 Tests of Players. ", The New York Times, August 16, 1924. Accessed January 25, 2011. ^ Caldwell, Dave. "Sprinter Turned Driver Is a Quick Study in Acceleration", The New York Times, August 30, 2009. Accessed November 26, 2013. "Brown, a 33-year-old native of Chesterfield, N.J., could become the first African-American to win a major N.H.R.A. championship.... Brown lived in Trenton until he was 6. When his grandfather died, his family moved to his grandmother’s 10-acre farm in Chesterfield, in the rural part of Burlington County." ^ Kaufman, Gil. "Jay-Z's 'Decoded': The Reviews Are In! Hov 'deserves the same level of respect as any of those great scribes,' one reviewer writes, comparing the MC to iconic poets. ", MTV, November 16, 2010. Accessed January 25, 2011. ^ Case III, George. "Remembering a Trenton dad who made his mark in the big leagues", The Trentonian, July 4, 2010. Accessed January 25, 2011. ^ Opdyke, Tom. "POP MUSIC THIS 'BOOTS' IS MADE FOR THE TENOR SAXOPHONE", The Morning Call, February 18, 1984. Accessed January 25, 2011. ^ Provizer, Norman. "RICHIE COLE BRINGS SAX APPEAL TO VARTAN", Rocky Mountain News, April 4, 1996. Accessed March 25, 2012. "On his current CD, Kush: The Music of Dizzy Gillespie, alto saxophonist Richie Cole spends most of his time in the company of a large brass section.... Instead, the Trenton, N.J. native will be in a quartet setting for a live recording on the Vartan Jazz label." ^ Staff. "RICHARD CROOKS WINS PLAUDITS ON RETURN; American Tenor Sings Oratorio and Opera Airs Before Throng in Carnegie Hall. ", The New York Times, October 27, 1927. Accessed January 25, 2011. ^ Urciuoli, Brielle. "Sarah Dash of Labelle talks at TCNJ about her Trenton roots", The Times (Trenton), September 24, 2014. Accessed October 28, 2014. "Musician and Trenton native Sarah Dash lectures at The College of New Jersey in Ewing on Wednesday, September 24, 2014." ^ Brown, John Howard. Lamb's Biographical Dictionary of the United States, Volume 2, 1900, page 394. Accessed November 25, 2012. ^ Bohlen, Celestine. "THE NATION: David N. Dinkins; An Even Temper In the Tempest of Mayoral Politics", The New York Times, September 17, 1989. Accessed March 16, 2012. "From his childhood, which he spent divided between New York City and Trenton, David Dinkins has kept steady control of his emotions, friends and family members say. When he was 6 years old, his mother left his father in Trenton and moved to New York, taking her two children with her. Mr. Dinkins later returned to Trenton, where he attended elementary and high school." ^ Freeman, Rick. "Diamond Reflections: Al Downing misses creativity in the batters' box", The Times (Trenton), August 18, 2010. Accessed March 20, 2012. "Over 33 years since he threw his last major-league pitch and nearly a half-century since he left Trenton to pursue a professional career, Al Downing remains a keen and opinionated observer of the game of baseball." ^ Harrington Emerson Papers, 1848-1931, Penn State University. Accessed October 19, 2013. "Emerson was born on August 2, 1853 in Trenton, New Jersey." ^ Bostrom, Don. "GALLAGHER LEADS PHILS PAST GIANTS OUTFIELDER'S 3-FOR-3 NIGHT SPARKS 2-1 WIN", The Morning Call, May 25, 1995. Accessed February 1, 2011. "With Lenny Dykstra nursing his sore lower back for the second straight day, role player Dave Gallagher took over the leading role. All the 34-year-old Trenton native did was go 3-for-3 to raise his average to a nifty .441." ^ Staff. "76ERS ADD GREG GRANT'S SPEED AS TEAM SEEKS ZIP IN OFFENSE THE TEAM'S NEWEST GUARD CAME FROM THE CBA TO HELP REPLACE VERNON MAXWELL. HE HAS A CHANCE TO STICK. ", The Philadelphia Inquirer, November 22, 1995. Accessed February 1, 2011. "Grant, a Trenton native, has played with five NBA teams since coming into the league as the Phoenix Suns' second round pick out of Trenton State in 1989." ^ Bennetts, Leslie. "New Face: Roxanne Hart Coming of Age In 'Loose Ends'", The New York Times, July 6, 1979. Accessed February 1, 2011. "She was born in Trenton, the oldest of five children, but moved from Delaware to Colorado to Georgia to Long Island..."
^ Staff. "SIXERS-NETS TALKS STALL OVER HINSON", The Philadelphia Inquirer, January 15, 1988. Accessed February 1, 2011. "'If it's in New Jersey, I'm close to home,' added Hinson, a native of Trenton." ^ Medal of Honor Recipients — World War II (G-L), United States Army Center of Military History, July 16, 2007. Accessed January 28, 2008. ^ D'Allesandro, Dave. "Notebook: Trenton native Dahntay Jones enjoying his best season yet with the Indiana Pacers", The Star-Ledger, November 17, 2009. Accessed February 1, 2011. ^ Staff. "Former JFK, LBJ aide remembers years in Washington", Associated Press, October 23, 2008. Accessed February 1, 2011. "Katzenbach, a native of Philadelphia who grew up in Trenton, NJ, was born into a political family." ^ Staff. "Falcons win at Lambeau, take on Vet next", Philadelphia Daily News, January 6, 2003. Accessed February 1, 2011. "Now it's on to Philadelphia, not far from Kerney's hometown of Trenton, to play the Eagles..."
^ Staff. "Trenton's own Ernie Kovacs to be celebrated Sunday, his 92nd birthday", The Trentonian, January 23, 2011. Accessed February 1, 2011. ^ Fletcher, Juliet. "There's No Place Like Home: After two years in New Hope, a Tin Man finds the heart of the gallery scene in Philly. ", Philadelphia City Paper, November 27-December 3, 2002 . Accessed March 20, 2012. "Partly why this Trenton expat moved his base of operations to Philadelphia from New York, 'where it costs four times what it does here to run a business month to month,' was to give artists -- particularly those very New York or West Coast-oriented -- a wider spread of support." ^ Strausbaugh, John. "Street Art That's Finding A New Address", The New York Times, March 7, 2010. Accessed March 20, 2012. "Mr. LeVine came to the movement the same way his artists did. He grew up in Trenton and earned a degree in sculpture, but he was less attracted to fine art than he was to underground comics, punk and hip-hop, 'anything subculture and edgy.' With a loan from his parents, he opened his first small art gallery in New Hope, Pa., in 2001." ^ Stone, Sally. "Judith Light: Is best always better? ", The Spokesman-Review, October 12, 1993. Accessed February 1, 2011. "Judith Light grew up in Trenton, New Jersey. After her junior year at St. Mary's Hall, a private girl's school, she enrolled in a summer drama program at St. Mary's Hall, a private girl's school, she enrolled in a summer program at Carnegie Tech..."
^ Joe Holley, "Former Diplomat Sol Linowitz, 91, Dies", The Washington Post, March 18, 2005. Accessed March 20, 2012. "Sol Myron Linowitz was the eldest of four sons born to Joseph and Rose Oglenskye Linowitz, immigrants from a region of Poland under Russian rule. He was born in Trenton, N.J., in a multicultural neighborhood of Jews, Protestants and Catholics, as well as one African American family." ^ Abdur-Rahman, Sulaiman. "Former 'Melrose Place' actress Amy Locane-Bovenizer of Hopewell indicted in fatal crash", The Trentonian, December 16, 2010. Accessed February 1, 2011. "Trenton-born TV and film actress Amy Locane-Bovenizer, whose resume includes several big screen gigs with Hollywood A-listers, was indicted Thursday on charges she was boozed up and driving recklessly when she killed a woman in a horrific two-vehicle accident June 27." ^ Staff. "REPORT: GIANTS' MCKENZIE ARRESTED FOR DUI", The Sports Network, November 14, 2008. Accessed February 1, 2011. "A Trenton, New Jersey native, McKenzie has played all but three games for the Giants since signing with the club as a free agent prior to the 2005 season." ^ Andres, Edmund L. "A Salesman for Bush's Tax Plan Who Has Belittled Similar Ideas", The New York Times, February 28, 2003. Accessed March 16, 2012. "Nicholas Gregory Mankiw: BORN -- Feb. 3, 1958, Trenton"
^ Staff. "Jim Croce and Maury Muehleisen's musical partnership endures", Inside Jersey, August 16, 2010. Accessed March 16, 2012. "Maury Muehleisen was blessed with many musical gifts.By the time he was a teenager, the Trenton native already was an accomplished pianist. In late 1970, at age 21, Muehleisen released Gingerbreadd, his only solo album, on Capitol Records." ^ Baldwin, Tom. "Where did Pike peak? Colo. explorer got start in New Jersey", Courier-Post, August 25, 2008. Accessed September 19, 2008. "Nineteenth century Jersey explorer Zebulon Pike was born in Lamberton, now a part of south Trenton, but gave his name to Colorado's 14,000-foot (4,300 m) Pikes Peak." ^ Bianco, Anthony. "Joe Plumeri: The Apostle of Life Insurance", Business Week, March 30, 1998. Accessed February 12, 2014. "That would be the blue-collar precincts of North Trenton, N.J., just 15 miles from here. The cool-walking demonstration ended, Plumeri explains how he stumbled into a career on Wall Street by taking a menial job at a brokerage house that he had mistaken for a law firm." ^ CEO Plumeri. Business Week. May 6, 2008. http://books.google.com/books?id=IkKTAAAAIAAJ&q=plumeri+trenton&dq=plumeri+trenton. Retrieved July 15, 2010. ^ Amy Robinson:Overview, MSN. Accessed February 8, 2011. ^ Staff. "Miller, Rodman highlight Hall of Fame finalists", Toronto Sun, November 30, 2010. Accessed February 8, 2011. "A native of Trenton, New Jersey, Rodman was a controversial presence both on and off the court despite winning five NBA titles (1988-89 with Detroit; 1996-98 with Chicago)." ^ Staff. "Talking too much for our own good", The Intelligencer, May 15, 2003. Accessed February 8, 2011. "That version of Bob Ryan spent 20 minutes talking about the Palestra, growing up in Trenton, and great writers from the Philadelphia area." ^ Weber, Bruce. "Thomas N. Schroth, Influential Washington Editor, Is Dead at 88", The New York Times, August 4, 2009. Accessed March 16, 2012. "Thomas Nolan Schroth was born in Trenton on Dec. 21, 1920, the son of The Brooklyn Eagle’s publisher, Frank D. Schroth." ^ Lamb, David. "General a winner who learned history's lessons", St. Petersburg Times, March 9, 1991. Accessed February 8, 2011. "H. Norman Schwarzkopf Jr. - the H. stands for nothing and he doesn't use the junior - was born in Trenton, NJ, 56 years ago, the son of German immigrants." ^ Burch, Audra D. S. "CODE BLUE BEST OF TIMES, WORST OF TIMES FOR BLACK COMICS", Chicago Tribune, April 13, 1997. Accessed February 8, 2011. "'I talk about what people are thinking about,' says Sommore, from Trenton, N.J. 'And I use curse words to enrich what I am saying.'" ^ Staff. "GM's history of CEOs - Robert C. Stempel", Los Angeles Times. Accessed February 8, 2011. "Stempel was born July 15, 1933, in Trenton, N.J."
^ Lee, Edward. "SPECIAL SEASON FOR RAVENS' STILLS ; RESERVE LINEBACKER, DOMINANT ON SPECIAL TEAMS, CALLS CAMPAIGN `HIGHLIGHT OF MY CAREER'", The Baltimore Sun, December 9, 2006. Accessed February 8, 2011. "A native of Trenton, NJ, Stills repeated the fourth and seventh grades and sat out his freshman year at West Virginia after being ruled academically." ^ Host: Ty Treadway at the Wayback Machine (archived January 13, 2008)., Merv Griffin's Crosswords. Archived as of January 13, 2008. Accessed March 20, 2012. "Ty Treadway was born Tyrus Richard Treadway on February 11 to Richard and Mary Lou Treadway. Ty joined six older siblings, and the family resided in Trenton, New Jersey." ^ Attner, Paul. "A work of heart: much of Eagles cornerback Troy Vincent's hometown of Trenton, N.J., is in disrepair. But his plentiful, passionate and personal work to rebuild and revitalize the community is beginning to show results and makes him No. 1 on TSN's annual list of Good Guys in pro sports", The Sporting News, July 7, 2003. Accessed February 8, 2011. "Troy Vincent is walking through the Wilbur section of Trenton, N.J. He grew up in Wilbur when survival was a daily 10-round fight. It's worse now." ^ Staff. "Local celebs need to brush up on Goodwill", 98.4 Capital FM, July 4, 2010. Accessed February 8, 2011. "In addition to Jay-Z and Russell Simmons, rappers Ludacris, Chuck D and Trenton’s own Wise Intelligent of the Poor Righteous Teachers will deliver taped messages to attendees." Wikisource has the text of a 1911 Encyclopædia Britannica article about Trenton, New Jersey. This page uses content from the English language Wikipedia. The original content was at Trenton, New Jersey. The list of authors can be seen in the page history. As with this Familypedia wiki, the content of Wikipedia is available under the Creative Commons License.